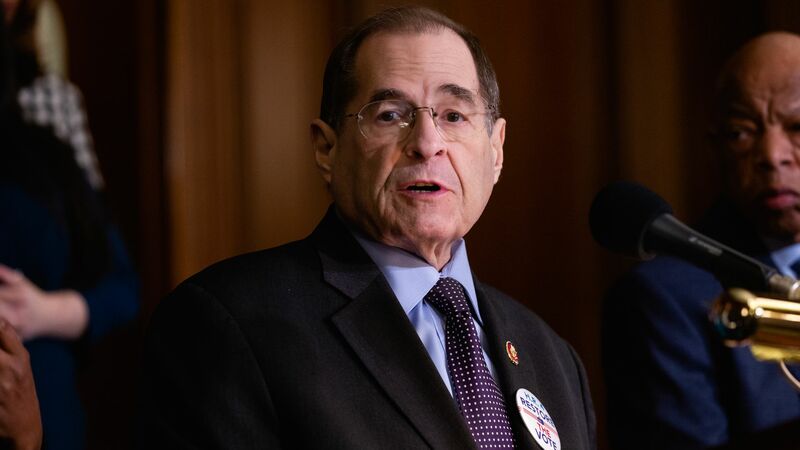 House Judiciary Chairman Rep. Jerry Nadler (D-N.Y.), told reporters on Wednesday that former acting Attorney General Matt Whitaker did not deny discussing details of the Michael Cohen case with President Trump, nor did he refute claims that he directly participated in conversations about whether to fire 1 or more U.S. attorneys in New York who brought the case against Cohen. Details: Whitaker, who was in charge of the Justice Department from November until last month, met privately with Nadler to clarify his public testimony that took place in February. However, the panel's ranking Republican member Douglas Collins (R-Ga.), who was present, pushed back against Nadler's characterization of Whitaker's comments, calling them an "inaccurate interpretation of what he said. Mr. Whitaker said he did not have conversations with the president about Cohen," said Collins, per CBS News reports. The backdrop: Whitaker testified last month that Trump had never pressured him to intervene in any investigation. Lawmakers, along party lines, have been questioning whether Whitaker misled Congress about his stint as acting attorney general, and his contact with Trump about the Mueller probe. President Trump late last year called acting Attorney General Matthew Whitaker to ask whether a Trump-appointed attorney could "unrecuse" himself in order to lead the Southern District of New York's investigation into hush money payments during the 2016 election, the New York Times reports. Why it matters: There is no indication that Whitaker took any steps to appoint Trump ally Geoffrey Berman to lead the investigation, which had ensnared the president's longtime personal attorney Michael Cohen. But Whitaker, who has reportedly told colleagues that part of his job was to "jump on a grenade" for the president, testified to the House Judiciary Committee earlier this month that Trump had never pressured him to intervene in any investigation. House Democrats are now pursuing a formal deposition of Whitaker as they scrutinize whether he committed perjury. Asked Tuesday whether the "unrecusal" conversation with Whitaker ever occurred, Trump responded: "No, not at all. I don’t know who gave you that. That's more fake news." The big picture: The Times piece reveals a number of unreported incidents over the course of the two last years that shed light on Trump's extensive efforts to derail the various investigations that threaten his presidency. After former national security adviser Michael Flynn was fired for lying about his contacts with Russian officials, Trump directed then-Press Secretary Sean Spicer to tell reporters that the president asked for his resignation — which the White House counsel later concluded was misleading. In the summer of 2017, after the president threatened to fire special counsel Robert Mueller, one of Trump's lawyers reportedly reached out to attorneys for Flynn and former campaign chairman Paul Manafort to discuss possible pardons. The bottom line: There are more than 1,100 instances of Trump publicly attacking the Russia investigations. This, the Times notes, has been "a public relations strategy as much as a legal strategy."